Buck Rock Lookout - Giant Sequoia National Monument - Beyond Limits on Foot! Directions: Heading south on General’s Highway (198) to Big Meadows Road. Turn left onto FS 14S11. After 3 miles you hit Horse Camp campground, turn left onto FS 13S04. Follow signs to Buck Rock, it is about 2.5 miles. There are restrooms and picnic tables, no water on site. We’ve been coming to Hume Lake for years and finally made it out to see this giant granite dome resting at 8502’. All we knew about this place was there was a rock with a tiny hut on it. Well curiosity brought us here to Buck Rock Lookout where a 360 degree view of the highest peaks of the Sierra Nevada and the San Joaquin Valleys ranges to the west can be appreciated. 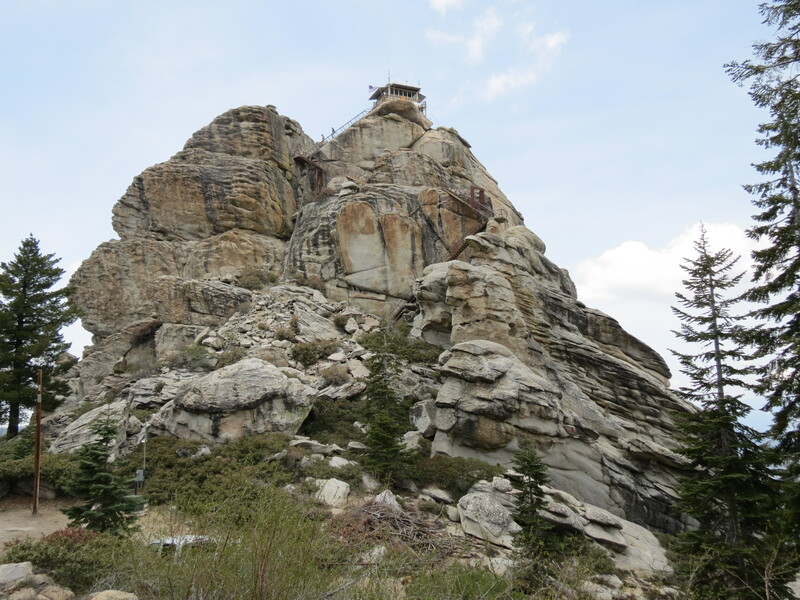 As we climbed 172 steps to the top of the rock, we discovered that this “hut” was actually a Fire lookout developed in 1912 as one of the first permanent fire detection locations in the Sierra Nevada. Before this platform was built in 1923, a ranger would have to climb onto it scanning for smoke only using the following: binoculars, a compass and a map. Now the hut is fully equipped with radios and a telephone to report fires and other emergency situations. Buck Rock Foundation worked with the Forest Service to obtain grants, recruit volunteers and renovate. It is staffed seven days a week during the fire season. No more than 6 people at a time are recommended on the lookout.